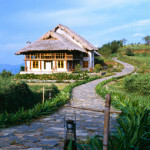 Fansipan Mountain is located 9km south-west of Sapa Town let in the Hoang Lien Mountain Range. It has been branded as “the Roof of Indochina” at the height of 3,143m. Mount Fansipan has been approved as one of the very few eco-tourist spots of Vietnam, with about 2,024 floral varieties and 327 faunal species. The topography of Fansipan is varied. Muong Hoa Valley, at the lowest altitude (950-1,000m), is created by a narrow strip of land at the base on the east side of the mountain. Geologists say the Hoang Lien Mountain Range, with Fansipan as its highest peak, did not emerge in the mountainous North West of Vietnam until the neozoic period (circ. 100 million years ago). Fansipan, a rough pronunciation of the local name “Hua Xi Pan” means “the tottery giant rock”. The French came to Vietnam and in 1905 planted a landmark telling Fansipan’s height of 3,143m… Very few people climbed to the top of Fansipan at the time. Then came the long years of war and Fansipan was left deserted for hunting and savaging. The trail blazed by the French was quickly overgrown by the underbrush. 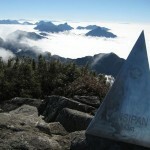 The summit of Fansipan is accessible all year round, but the best time to make the ascent is from mid-October to mid-November, and again in March. Kindly note that this is a tough trek… suggested to be done after you have climbed mountains like Kinabalu and/ or Rinjani. Check in at the Airport at least 2 hours before flight departure. The train will arrive in Lao Cai station around 6:30 in the morning. The driver will pick up the Singaporean group from station to Sapa for breakfast at local restaurant. 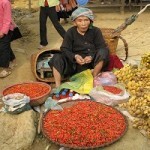 9:00 you are transferred to the start point in Tram Ton, amongst the H’mong Village. Commence the Fansipan Trekking, with a light lunch stop at about 1300m. Continue through the bamboo forest until arrival at base camp located at 1650m. Dinner with the local porters. Overnight stay in tents. Breakfast. 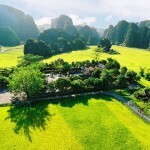 Continue down the valley to ascend the ridges towards the Roof of Vietnam. Continue trekking, aim to arrive at the Summit (3143m) for a late picnic lunch. After the usual mandatory photo shoot, descend to base camp, arriving before last light. Overnight stay in Tents. Descend, re-cross the stream to continue the trek towards the end point. Connect to the waiting vehicle for the drive back to Sapa for a quick shower. At the pre arranged time, you board the bus for Hanoi. Arrive Hanoi around 21:00. Overnight in Hanoi. Breakfast at your hotel in Hanoi. Transfer to the airport for the flight back to Singapore.